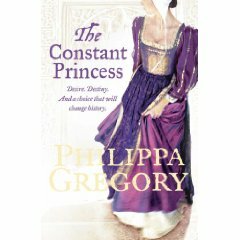 The Constant Princess by Philippa Gregory – It's Time to Read! Splendid and sumptuous historical novel from this internationally bestselling author, telling of the early life of Katherine of Aragon. We think of her as the barren wife of a notorious king; but behind this legacy lies a fascinating story. Katherine of Aragon is born Catalina, the Spanish Infanta, to parents who are both rulers and warriors. Aged four, she is betrothed to Arthur, Prince of Wales, and is raised to be Queen of England. She is never in doubt that it is her destiny to rule that far-off, wet, cold land. Her faith is tested when her prospective father-in-law greets her arrival in her new country with a great insult; Arthur seems little better than a boy; the food is strange and the customs coarse. Slowly she adapts to the first Tudor court, and life as Arthur’s wife grows ever more bearable. But when the studious young man dies, she is left to make her own future: how can she now be queen, and found a dynasty? Only by marrying Arthur’s young brother, the sunny but spoilt Henry. His father and grandmother are against it; her powerful parents prove little use. Yet Katherine is her mother’s daughter and her fighting spirit is strong. She will do anything to achieve her aim; even if it means telling the greatest lie, and holding to it. Philippa Gregory proves yet again that behind the apparently familiar face of history lies an astonishing story: of women warriors influencing the future of Europe, of revered heroes making deep mistakes, and of an untold love story which changes the fate of a nation. This is the first book in Philippa Gregory’s Tudor series. In this book we meet Katherine of Aragon, first as a girl of 5, then as a girl of 15, as she marries Arthur. We watch their love and affection develop, and their intimacy increase, until one fateful day when Arthur dies. Katherine, a strong-willed woman, determined to be Queen of England, steps up and tells one great lie – that their marriage was not consumated. The result – her marriage to Arthur’s brother Henry. We see them crowned, and Henry become Henry VIII. With her power she manipulates, goes to war and struggles with the reality that her parents have used her as a pawn in their power struggle in Europe. But Henry is youthful and lustful – he longs for war, love, attention and an heir. How long until his eyes stray and her deadly secret is revealed? This was an enjoyable read. Gregory takes us on a historical adventure, in both England and Spain, incorporating their two histories. She writes about European battles between France, England and Spain, and of Spanish battles with the Moors. She looks at how people are the same, even if they have different religion, and she shows what lengths people will go to to achieve their ambitions. I liked how Katherine was written, a strong women, determined to do whatever it takes to achieve her destiny, even lying and manipulating, but yet a gentle, loving woman, who mourned Arthur’s death and was crushed by the death of her little boy. Henry was a bit irritating, but well written, as he was just a spoilt boy, as can be seen through his history and his string of marriages. The ending is not a surprise because this is based on English history, but I liked how Gregory broke off. There are no surprises but that does not spoil the book at all. Gregory has re-told this event in history with creativity and passion. This is a good book, well worth reading.